Joplin, Mo. — Meet Gary Greene of Carl Junction. 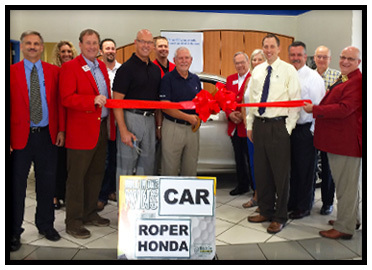 Last August during the Joplin Area Chamber of Commerce’s annual fundraising Hot Links Golf Tournament, Greene won a 2014 Honda Accord, courtesy of Roper Honda, and paid for by Hole In One International. Greene won the new set of wheels after acing the 140-yard 16th Hole at the Eagle Creek Golf Club with an 8 iron. But here’s what makes the story even more amazing — this wasn’t Greene’s first hole in one — or even his second. Nope, this was Greene’s sixth hole in one. Yep, that’s right SIX! Although it was the first time he’s ever won a prize. According to Stephanie McGrew, Member Events Producer with the Joplin Chamber, the Hot Links Annual Golf Tournament is not only one of the premier golf events in the Joplin area but also one of the Chamber’s leading fundraising activities, raising $20,000 last year. McGrew, who has been working with Hole In One International since 2003, was shocked and thrilled to have a winner as was the hole in one contest sponsor, Roper Honda. “Hole In One International’s service went way beyond my expectations. When we had the winner, everyone said to me, ‘Oh, now your work begins.’ I expected this long drawn out process, but within minutes of reporting the claim, the paperwork was emailed to my phone. I had the pro print it, we filled it out, sent it back and I was done! I just couldn’t believe how easy it was,” explained McGrew. Are you ready to give a lucky player the chance to win an amazing prize this season? Today is a great day to get started! Call us today at 800-827-2249 for a free, no-obligation quote.